I am looking at anime now! I saw it and it's so good! It's a shame there aren't many fan-arts for this series. I really like the way you colored this drawing, the light and shading gives Deckard nice and shiny metallic look! He has an adorable smile here , and Yuuta's pose is cute too. I can totally see him say "Okay! Go solve that crime! (And look handsome while you do it!)" Teehee! This show is so Awesome!!! Brave up! Ah I love this show so much! 1. Transformers series is a very popular show & the only t.v. 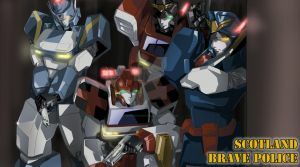 series recognized worldwide w/ its umm... trademark handsome 'good-looking' giant sentient humanoid robots. Great job on this!You did a really excellent job on this! They don't get a lot of love! I love Brave Police J Decker!! You did an awesome job drawing Deckerd and Yuuta!!! :C I can't find it to watch online.. looks lovely though! Sweeeeeeeeet!! You draw Deckard and Yuta pretty good! Oh my goodness!! You drew Yuta so adorable and Deckerd looks sooo cool !! Brave Police J-Decker is such an awesome anime ! Deckard and Yuuta look great! Excellent work on this, this piece looks fantastic~. Oh dear, my favourite chracters from Brave Police J Decker!